Not junky bad, but junky good! 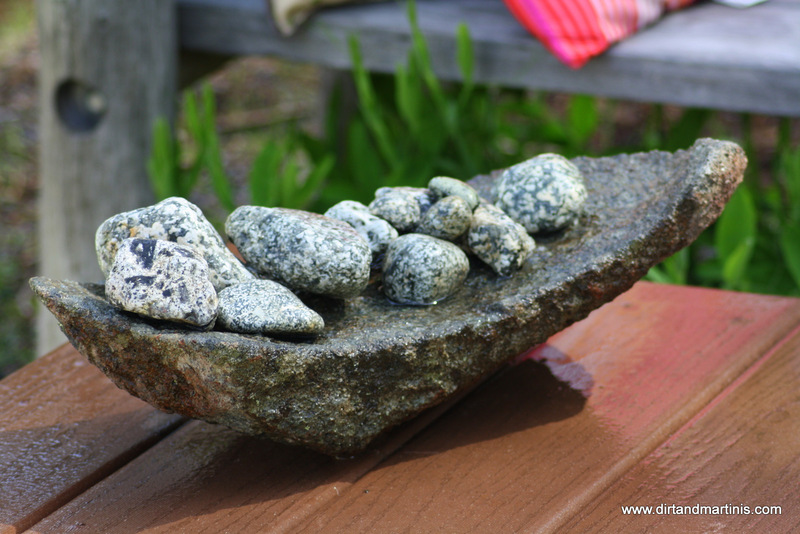 I realize it is appalling for some people to use junk in the garden but not to me. Most of my garden “art” is aged, rusty, and weird but in my eyes it’s interesting to look at and the BEST part- most of it was free! I admit and confess I’m a junk junky . 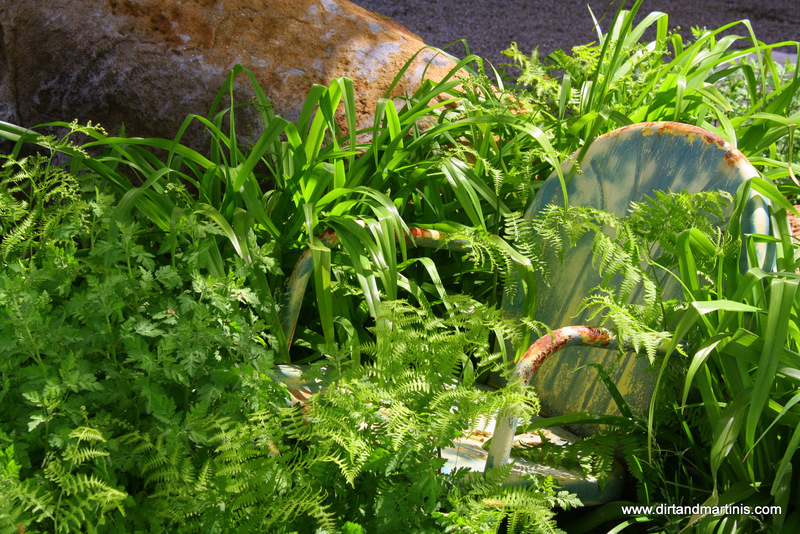 Recently I had a chat with someone that was down in the dumps because her garden was blah and boring. She procrastinated doing anything to update it because she thought it would take wads of cash to even get her garden space comfy and inviting. This made me sad. 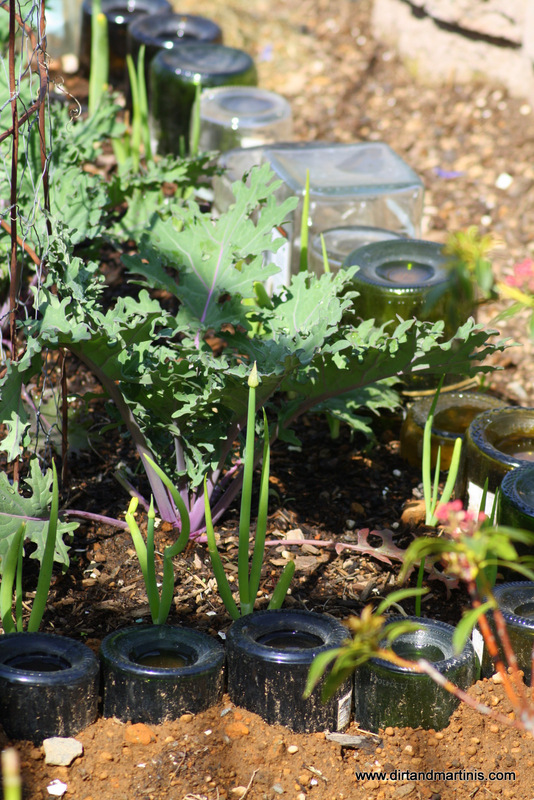 Create flower/vegetable beds and borders out of bottles from your recycle bin or do what I did…put the word out on Facebook and you’ll have bottles in no time! 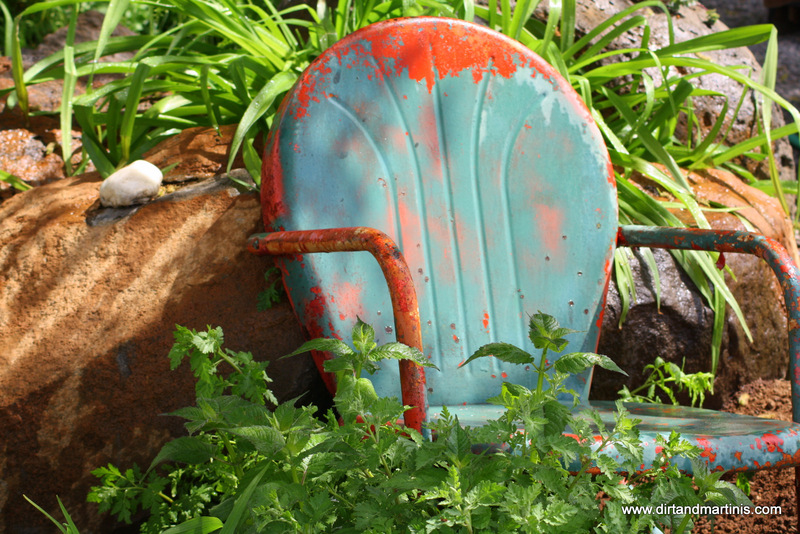 So, I hope this has given you some junkalicious inspiration to get in the garden and be creative with found objects and items headed to the dump. 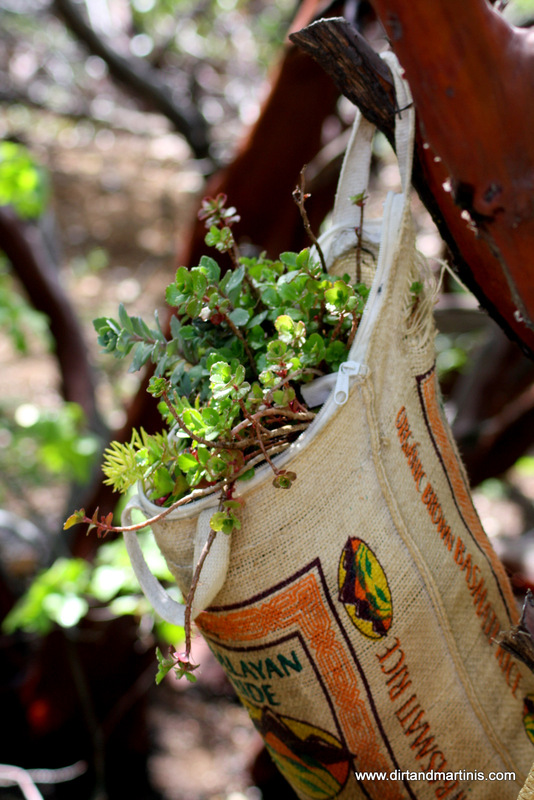 Gardening with reused materials sometimes is a better and prettier way to go, especially, when you don’t have a lot of money in your pocket. What sort of fun ways do YOU garden? I’d love to hear from you!!!! That’s so nice Suzie! I’m glad to know my weird garden is actually cool to some people, lol! I know, haha! I just couldn’t throw those chairs out. I have a lot of “junk” in my garden too! Like the rice bag planter! I grow succulents in a broken Le Creuset stockpot, various old mugs, an old toilet tank as well as an old toilet. 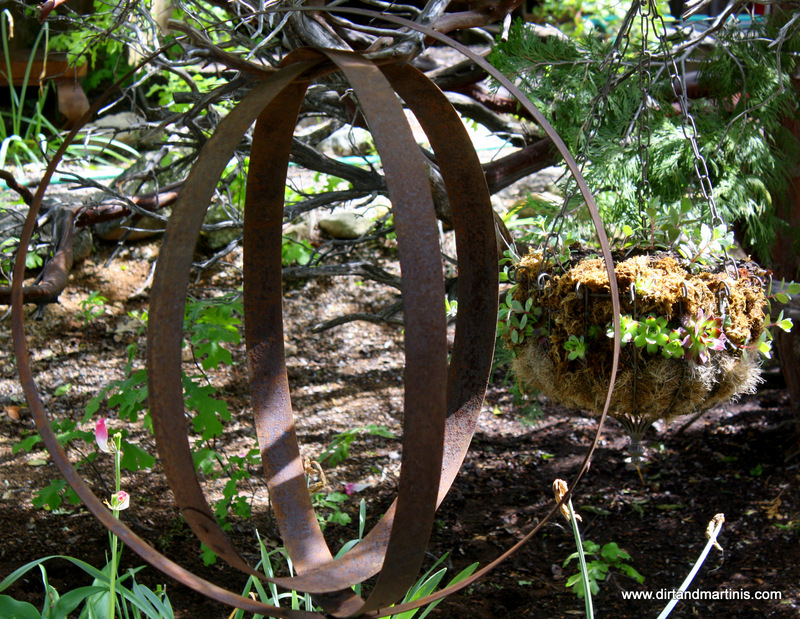 My garden is full of repurposed found objects. That’s cool Linda! I’d love to see pictures of your garden “art”!!!! 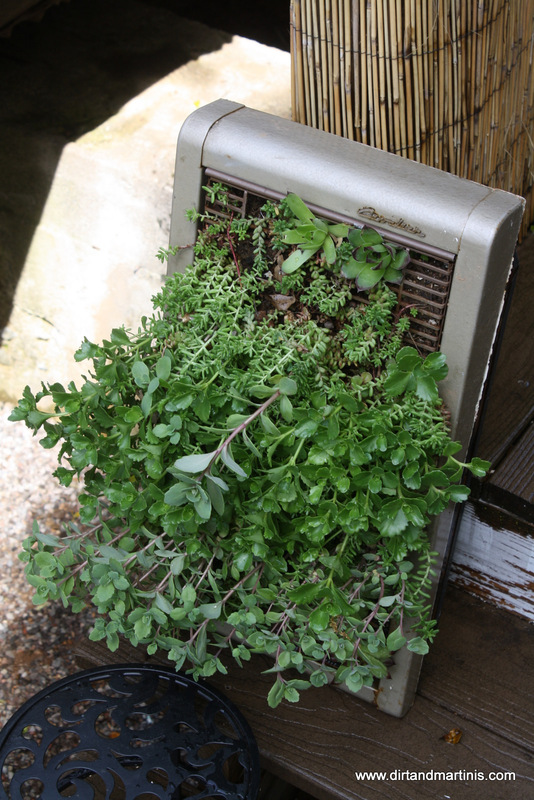 Love the heater planter too. The contrast of green and metal is a piece of art and makes one think of abandoned cities overgrown with jungle. Haha! I don’t know what possessed me to plant in a heater Stacy. It’s definitely a conversation piece, lol! I have been collecting wine bottles to just this to my yard…almost have enough too…love your garden! it is very inspirational! Great reuse of some good ‘ol junk. I love when people do their gardens up good with some ‘junk’. Thanks Lisa! I love me some junk! I love your site! didn’t realize you had one until today girl…loving the junky garden stuff…I am a junky gardener too! there are some really great ideas in this post! have a great week!!!! I WILL be back! Greeting Anja! 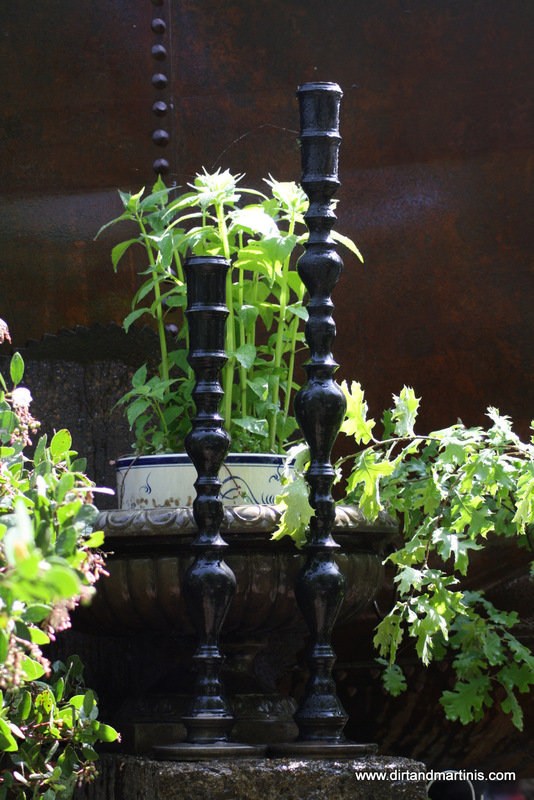 Using bottles in the garden is so much fun and adds a whimsical touch! Thanks for stopping by!! !